From a space exploration standpoint, 2015 crushed it real hard. NASA's New Horizons spacecraft took this high-resolution enhanced color view of Pluto on July 14, 2015. It can discern details and colors on scales as small as 0.8 miles. This region is informally called Sputnik Planum and it has been found to be rich in nitrogen, carbon monoxide, and methane ices. The New Horizons spacecraft snapped this awesome shot of great blocks of Pluto’s water-ice crust jammed up against some jagged features informally named the al-Idrisi mountains. This view is about 50 miles wide. NASA's New Horizons captured this high-resolution enhanced color view of Charon just before closest approach on July 14, 2015. Charon is 754 miles across. This photo was taken by NASA's HiRISE camera on the Mars Reconnaissance Orbiter. From NASA: "Ophir Chasma forms the northern portion of Valles Marineris, and this image features a small part of its wall and floor. The wall rock shows many sedimentary layers and the floor is covered with wind-blown ridges, which are intermediate in size between sand ripples and sand dunes. Rocks protruding on the floor could be volcanic intrusions of once-molten magma that have pushed aside the surrounding sedimentary layers and 'froze' in place." This image of Mars' surface was taken on January 5, 2015 by NASA's HiRISE camera onboard the Mars Reconnaissance Orbiter. This picture, taken by NASA's HiRISE camera on the Mars Reconnaissance Orbiter on August 26, 2015, captured a small avalanche in progress. According to NASA: "The small white cloud in front of the brick red cliff is likely carbon dioxide frost dislodged from the layers above, caught in the act of cascading down the cliff. It is larger than it looks, more than 20 meters across, and (based on previous examples) it will likely kick up clouds of dust when it hits the ground." This is a view from the "Kimberley" formation on Mars taken by NASA's Curiosity Rover. According to NASA, "the colors are adjusted so that rocks look approximately as they would if they were on Earth, to help geologists interpret the rocks." This image of Mount Sharp was taken on September 9, 2015, by NASA's Curiosity rover. The colors in this photo are adjusted in the same way as the previous photo. Curiosity's MastCam snapped this shot of its own drill just after investigating a rock called "Telegraph Peak" on February 24, 2015. This photo is in true color. Dwarf Planet Ceres' Occator crater taken by NASA's Dawn spacecraft from an altitude of 915 miles. The crater is 60 miles across and two miles deep. Scientists are still not sure what is causing the high amount of reflection in this region. This map-projected view of Ceres was created from images taken by NASA's Dawn spacecraft between August and September 2015. The redder colors are places that reflect light strongly in infrared while bluer areas reflect light more strongly in shorter wavelengths. From NASA: "Scientists use this technique in order to highlight subtle color differences across Ceres, which would appear fairly uniform in natural color. This can provide valuable insights into the mineral composition of the surface, as well as the relative ages of surface features"
The ESA's Rosetta spacecraft snapped this photo at a distance of 19 miles in January 2015. From the ESA: "This view was taken [...] from the comet centre and features the small lobe to the left, including the Hathor cliffs, and the smooth boulder-strewn neck Hapi region right of centre. Hints of the comet’s large lobe are seen in the foreground." ESA's Rosetta Mission created this four-image mosaic of the comet's surface from pictures taken on February 14th, 2015 at a distance of only 5.5 miles above. Saturn's moon Mimas, shown along with the planet's massive rings, is lit by light reflected off of Saturn in this picture taken by NASA's Cassini spacecraft on Feb. 16, 2015. This image, created by the Chandra X-Ray Observatory and a number of other telescopes, shows a group of galaxies crashing into one another nicknamed the "Cheshire Cat." From Chandra: "Some of the cat-like features are actually distant galaxies whose light has been stretched and bent by the large amounts of mass contained in foreground galaxies. This is an effect called 'gravitational lensing.'" This image, taken by the Hubble Telescope, shows the galaxy Messier 94, which is about 156 million light-years away from Earth. Between June 21 and 25, 2015 of this year the Sun released at least five solar flares. These images were taken in extreme ultraviolet light by NASA's Solar Dynamics Observatory. NASA astronaut Scott Kelly photographed this shot of the Nile River during a nighttime flyover on September 22, 2015. The International Space Station shows up as a tiny silhouette as it passes in front of the Moon on August 2, 2015. NASA astronaut Scott Kelly took this photograph during a spacewalk on October 28, 2015. He is currently aboard the International Space Station spending a year in space — a longer period of time than any other American astronaut. NASA astronaut Kjell Lindgren took this photograph on Nov. 11, 2015 from the International Space Station. 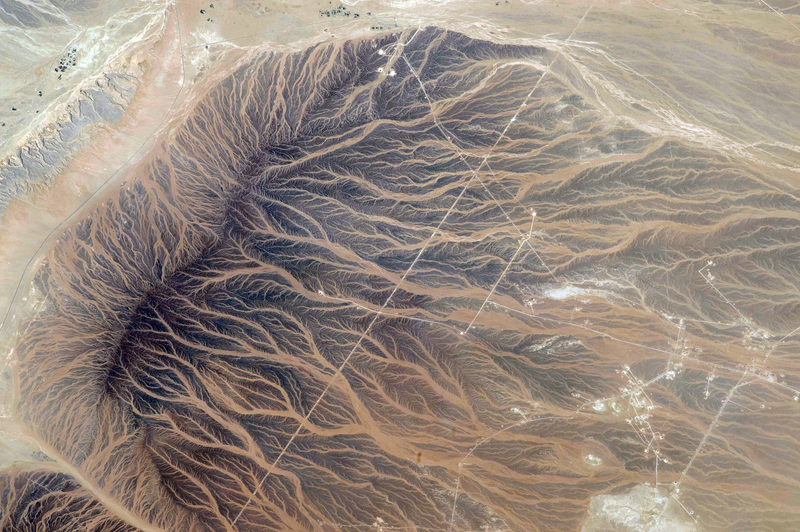 According to NASA: "Lindgren wrote, 'The delicate fingerprints of water imprinted on the sand. The #StoryOfWater.' The area photographed is located in Oman, approximately 20 km to the west-northwest of Hamra Al Drooa."